As a female announcer on Soviet radio read out the day’s soccer scores, Vladimir Safarov, a dedicated supporter of Tashkent club FC Pakhtakor, had a feeling something wasn’t right. “The game between Dinamo Minsk and FC Pakhtakor did not take place, and will take place much later,” the announcer said. It was August 1979 and Safarov was stationed in Damascus as part of a Soviet engineering corps working on Syria’s national rail grid. Within hours, Safarov’s Arab colleagues had broken the bad news that Soviet media was still studiously ignoring. “They told me that a plane carrying players from Pakhtakor had fallen out of the sky in Ukraine on its way to Belarus. I didn’t believe it at first. But then we tuned into Voice of America and heard the same thing,” he told Eurasianet. It would take a full week for the official version of events to reach Tashkent. On August 11, a collision of two airplanes above the Ukrainian city of Dniprodzerzhynsk (now Kamianske) had killed 178 people, including 17 players and staff of Pakhtakor. By that point Uzbekistan’s capital was already ensconced in grief. Feeding off a diet of foreign radio reports and hearsay, a numb, shocked crowd of thousands of people had gathered outside the club’s storied stadium. Some had taken to sleeping on the streets. One rumor doing the rounds was that the plane had been shot down after being mistaken for a hostile craft. After all, Soviet leader Leonid Brezhnev had been on a flight to Crimea at around the same time the collision had taken place. A belated state newspaper report featuring tributes to players killed in the crash was followed by a massive public funeral in Tashkent, where 178 symbolic stones were buried. The news that a court had handed two air traffic controllers 15-year sentences for dereliction of duty provided a semblance of closure for some, but no consolation. “What we lost in that disaster is difficult to quantify,” said 79-year-old Safarov, who eventually moved from engineering into sports journalism, and is now regarded as Uzbek soccer's pre-eminent historian. Pakhtakor was neither the first nor the last soccer club to be devastated by an air disaster. A plane crash that killed 23 people following an abortive takeoff in Munich in 1958 robbed Manchester United and English football of some of its leading lights. FC Torino of Italy was arguably the greatest club in the world at the time of the 1949 air disaster near Turin that claimed 38 lives and left no survivors. In 2016, all but three members of the talent-packed first team of Brazilian club Chapecoense were killed after a plane crashed approaching the main airport in Medellin, Colombia. The strange structure of Soviet football meant that the Pakhtakor air disaster was very much a national tragedy. Football authorities in Moscow viewed it as desirable for every republic to be represented in the Union’s Top League. Pakhtakor became the first team from Central Asia to play at such a level in 1959. It was joined shortly afterwards by FC Kairat of Almaty in Kazakhstan. 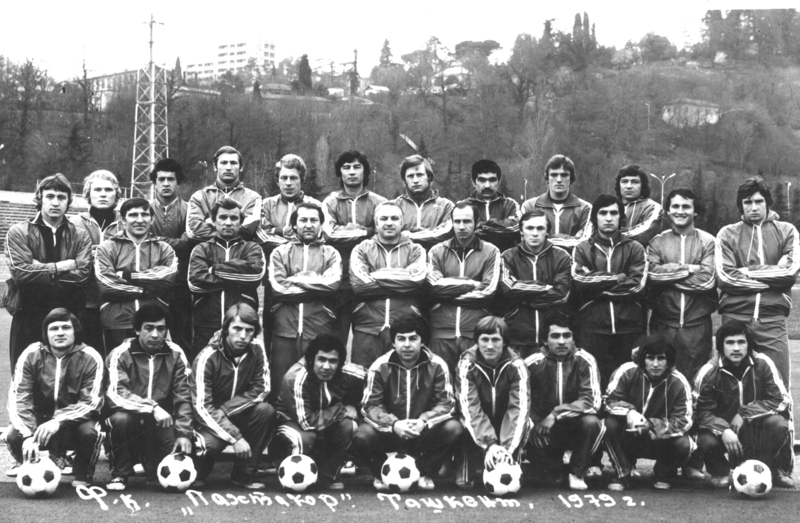 Although other Pakhtakor teams achieved more, the team of the mid-to-late 1970s that consisted almost exclusively of Uzbekistan-born players was particularly beloved. “We would go out to try and demolish sides,” recalled Tulyagan Isakov, the team’s captain and center-forward, who missed the visit to Dinamo Minsk with a career-threatening injury and attended the funeral on crutches. One obvious shortfall of Pakhtakor's outgoing playing style – an old-fashioned version of the high-pressing tactics favored by modern-day super-coaches like Jurgen Klopp and Pep Guardiola – was that it left the defensive line sorely exposed. In the 1974 season, Pakhtakor was behind only league-winners Dynamo Kiev in terms of goals scored but conceded the third most goals out of the 16 teams in the league. The team ended the season mid-table. The next season, Dynamo Kiev arrived at a struggling Pakhtakor for a league clash just over a week after having beaten a vintage Bayern Munich side in the European Supercup final. In a stunning result, the Uzbek team, whose name translates as “cotton picker,” routed the champions 5-0. The lynchpin of that performance and other famous Pakhtakor victories was the wiry and gifted midfielder Mikhail An. An was also ruled out of the fateful Dinamo Minsk clash with an injury but was persuaded to board the plane anyway in order to boost squad morale. When Isakov paid a visit to his teammate’s grieving mother after the crash, “she greeted me like a son,” he recalled. Eventually, Isakov would return from injury to train again with Pakhtakor. The club had been reinvented with players donated by other top league clubs and provided three years immunity from relegation by the Soviet football authorities. But it would never be the same. Nobody has done more to keep the memory of that doomed team alive than 75-year-old Alla Tadzetdinova. Her then husband-to-be, Igdai Tadzetdinov, was club captain when, at the age of 17, she went to watch a training session with a football-crazy friend. The courtship lasted a matter of months before the pair married. A daughter arrived two years later. By the time of Tadzetdinov’s death in the skies above Dniprodzerzhynsk, he had become the club’s irrepressible first team coach. The family got 300 rubles, roughly equivalent to around two months’ worth of an average monthly salary, in compensation from the government. Tadzetdinova regularly speaks at youth soccer tournaments held in honor of the players and is planning a film about the 1979 team in time for the 40th anniversary of the crash. Whenever she makes an appearance at the ground that has dominated her entire adult life, club dignitaries flock to pay homage. Isakov, who has become increasingly reticent to speak publicly about the tragedy, refused several interview requests from Eurasianet until Tadzetdinova intervened and summoned him to the stadium. “If he is hiding somewhere, we will find him. If he has crawled into a bottle, we will pull him out,” she promised. The strong bonds connecting the duo and Vladimir Safarov, holdovers from a more intimate, Soviet-era Tashkent, were plain to see. But for all Tadzetdinova’s force of personality, she is still consumed by the tragedy. She has over the years made countless visits to the area of eastern Ukraine where debris from the fallout was first found nearly four decades ago. A memorial to the dead now marks the spot. Lacking access to government documents on the tragedy, she has steadfastly refused to believe the official narrative of a mid-air collision. In 2010, she even went on an oddball Ukrainian TV program called Battle of the Psychics in an attempt to get to the bottom of the mystery. Later, the producer of the show sent her a letter claiming to have been in contact with an anonymous eyewitness who had seen the plane explode in mid-air and “come to understand” it had been shot out of the sky by a missile. But the account offered in the letter, which Eurasianet has seen, is far from convincing. The pain of the decades past is compounded by the fact that the club Tadzetdinova's husband gave his life to is no longer top dog in the domestic game. Uzbek football as a whole has regressed significantly since Pakhtakor’s heyday, even as player salaries have soared. Soccer players past and present still provide the main theme of conversation at the Tadzetdinov household, where a shrinking group of friends and relatives connected to the pre-crash Pakhtakor era still gathers occasionally. “Playing for us is not like playing for some other clubs,” she said. Chris Rickleton is a journalist based in Almaty.